I really try and keep meg-made my place of positivity and happiness. But then I thought, it might be okay to write this post about what I've been going through lately. And even though it won't be entirely sunny and happy, it'll be honest and open and maybe just maybe, someone out there will have been through this too and might be able to suggest something that will help. I've been a migraineur ever since I was 9 years old. They run in the family and so it was just a normal but disruptive part of growing up that my brother and I both just had to deal with. All with the hope and expectation that we'd grow out of them just as our parents did. And whilst this was mostly true for my brother, it unfortunately didn't happen for me. Mine have continued on throughout adulthood, and throughout this pregnancy, have stepped up in severity and frequency. I am not taking one second of this pregnancy for granted, believe me, but I am finding myself counting down more desperately than I want to be, and just want some relief. I'd read the stats that 10% of American's suffer migraines. This number seemed outrageous to me. It just doesn't seem possible that 32 million people go through what I am going through. And so I did a little bit more reading about types and classifications of migraines, and found that my migraines are whats called a Hemiplegic Migraine. 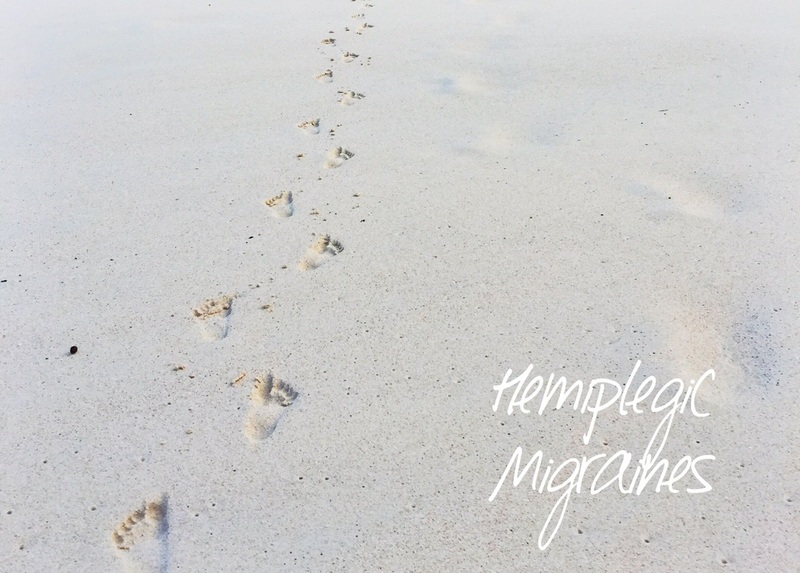 Hemiplegic means temporary paralysis on one side of the body, and is what happens during a migraine attack, in addition to the aura, nausea and intense headache. The predicted number of Americans that suffer this type of migraine is 0.03%. Far more likely!! When I get a migraine I get the aura first. I start to get flickering lights that spread until about 90% of my vision is flashing. This usually lasts for about an hour. I then get the numbness/tingling down one side of my upper body, which usually starts in one finger and spreads through my hand, arm, partial lip, one eye, one cheek and even half of my tongue goes numb. This stage usually lasts about half an hour and leaves me feeling weak and nauseous. I don't get sick each time, but I always then get the splitting headache afterwards. The headache can last anywhere from a few hours to two days, although lately, it does seem to finish sooner, just in time for the next attack to begin. It breaks my spirit a little every time someone assumes that my migraines are just bad headaches.As though I wouldn't continue living a normal life if it was a headache. But it couldn't be further from the truth. At the moment I am really struggling. I am getting daily attacks. Daily. I am living in a constant cycle of fear of another one coming, and then recovering from the previous one. Not being able to make plans or know whether I'll be able to pick my daughter up from school or not is starting to get me down. Pregnancy has always challenged my body in unusual ways, but this has become beyond manageable and all-consuming. I reevaluated my diet and discovered a few new possible triggers that were to blame, but having had a month eliminating a fairly substantive list of foods without any improvement has led me to think perhaps it is not just based on my diet. I had a few friends contact me and suggest that I try coffee as a preventative measure. And I was so excited to give it a go. But on day 3 of bringing caffeine into my daily diet I had to abandon the trial due to a rather severe case of gastroenteritis. I'm not sure whether it was brought on by the coffee or just exacerbated by it, but either way, the trial had to end. And being 7 months pregnant, I decided that now is not the right time to be messing around with caffeine anyway. So now I am back to the drawing board. I am seeing a physio to evaluate my neck and perform some acupuncture but this too seems not to be working. Nothing seems to be working and I am starting to find my strength wavering. All I want is to be able to enjoy these final few months of this pregnancy. Or, I even want to waddle and whinge about normal pregnancy problems, but for now, all of these niggles and braxton hicks contractions seem to pale in comparison to the debilitating attacks of hemiplegic migraines. But I have to have hope. I can hope that as ferociously as they increased they will decrease. I hope that I can get back to a manageable level so that I can look after Madeleine and spend some time preparing for her baby brother's arrival in December. I hope that whatever is triggering them might magically settle down so that I can have some peace in my head again. I wonder whether anyone else has been through this in pregnancy and has any advice on what to try or how to manage. Without being able to medicate myself it is proving very difficult to find a treatment plan to help. But surely other women have survived this awful ordeal and can share their strategies with me? I'm sorry for the less than cheery post. I wanted to share whats going on and why I've not been, well, doing anything much of late, but I will muster up some positivity again soon I promise. The photos in this post are from my happy place, Byron Bay, and just looking at them makes me feel a sense of calm, which is why I've included them in this otherwise miserable post. I still have so many posts I want to write, but computers aren't my friend at the moment, so bear with me while I use my opportunities as they arise.